Camping with axes, hatchets and saws? Leave them at home. Growing up, many of us were taught that axes, hatchets and saws are a natural part of camping. Upon arriving at camp, the bushcraft tools come out to process trees for firewood and benches, move limbs out of the way for tents and hammocks or harvest boughs to whittle, build and play with. If you’ve ever been to a campsite where live saplings and trees have recently come under the axe, you’ve seen the evidence. 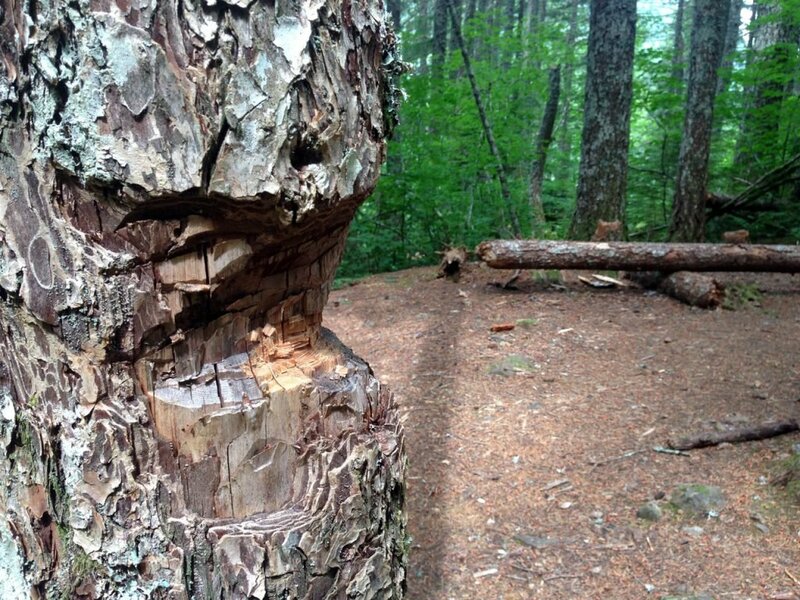 What used to be trees now look like broken, splintered teeth sticking out of the ground. The more it happens the more the campsite expands and surrounding foliage is denuded. This damage has become a significant issue in many places along the PCT and other backcountry getaways. 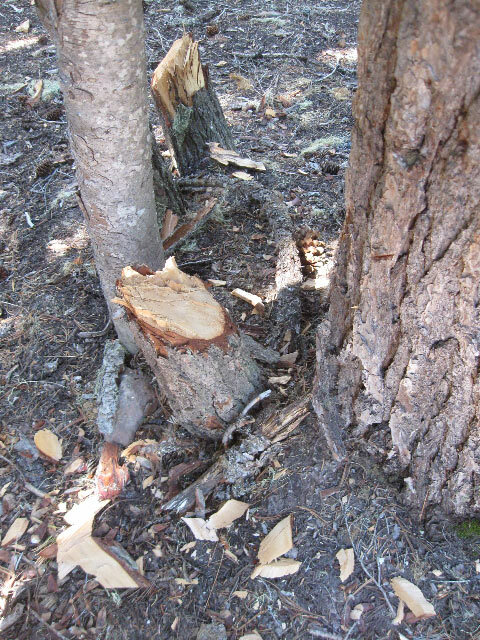 Tree damage caused by people playing with hatchets, saws and axes is a significant problem and a mark of the increasing impact people have on the PCT. Leave these wood tools at home. Let’s face it: it’s time to leave hatchets and saws at home. The PCT is popular and very narrow. Some trailheads, such as the one at Echo Lake near Lake Tahoe, can have more than 1,000 people a day coming or going. Imagine the random damage 1,000 axes could cause. As long as we all share a strong Leave No Trace ethic, we can all enjoy the trail with minimal damage to our precious and sometimes delicate landscapes. It’s when we camp, even just one night, that we’re prone to leave the biggest trace. The impact is far greater when we have axes and saws in our packs. Working together, we can defend campsites along the PCT from needless multiplication, expansion and degradation. You may be glad you left those tools at home. After all, hatchets and saws are the first thing to go in a pack shakeout. They’re non-essential. They’re heavy. Their sharp blades can damage the rest of your gear. And they increase the potential for injuries, which quickly can become quite serious in remote places. At many places along the PCT, any available firewood has been scoured long ago. There are just too many people using campsites to sustain raging bonfires night after night. If you do have a fire, please keep it small. Better still, forego the fire entirely, especially in areas where wood is scarce such as higher elevations, heavily used areas or in desert settings. Cook on a stove. If you like, gather around a candle lantern. Let your eyes adjust to the darkness and enjoy the stellar night sky. Trees cut down in a campsite. Photo by John Schubert. If you do decide to have a small fire, you still don’t need that axe or saw. There’s a big difference between collecting dead and down sticks and harvesting a live tree or processing something big. Killing or damaging trees is actually illegal in many areas where the trail passes. Besides, live trees don’t burn well. Only chopping dead wood, you say? Well, even that isn’t such a great idea. By leaving sharp tools at home, you’re leaving the largest deadfall in its natural setting where it belongs, to decompose and benefit the ecosystem. Always check trailhead bulletin boards for local campfire regulations. They change from place to place and season to season. And if you have a fire, be certain it’s completely out before you go to sleep or leave, and remove all unburned trash and food from the fire ring. But what about survival? Aren’t sharp tools essential for wilderness survival? The venerability of woodcraft reached its height around the turn of the 19th century. At the time, the population was low, trails were few, and forging one’s way in the wilderness required cultivating skills in hunting, tanning furs, preserving game, building campfires, setting up shelters and finding one’s way though the forest. Early scouting programs were focused on such skills. But times have changed and civilization now pervades the landscape, encroaching upon open spaces, even wilderness areas. If everyone on the PCT were to behave as though they were forging their way through the wilderness, there soon would be no wilderness left. Today, the Boy Scouts of America teaches scouts not to hack trees and alter campsites. With all of that said, “bushcraft” is becoming increasingly popular, in large part due to internet driven interest. Good campsites are found, not made. Don’t build stuff and don’t clear vegetation. It really is quite possible to get up close and personal with nature and have a comfortable familiarity with its flora and fauna without trying to turn it into your living room. Do not dig tent trenches or build lean-tos, tables or chairs. Never hammer nails into trees, hack at trees with hatchets or saws or damage bark and roots by tying horses to trees for extended periods. Having wood tools in your pack tempts you to use them. Leave them at home and you won’t have the means or temptation to cause damage. The PCT is a major corridor. It is not a suitable place to build your lean-to or teepee. Hobbyist survival shelters end up as trash once you leave. 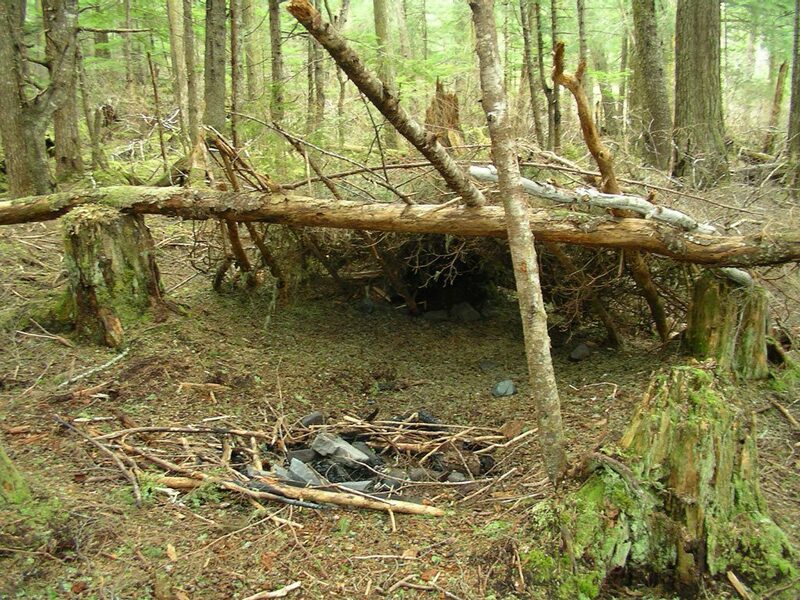 If you’d like a place to build a survival shelter or practice woodsman skills, do it at home or on private property. Sure, the PCT itself is technically an artificial ”built” facility. That’s true. But for the most part, the trail is rustic and understated. It serves to call attention to its surroundings, not to the tread itself. Campsites along it should exist the same way. The best ones are small and natural, with enough space to sleep and eat, but not some kind of massive, barren room with makeshift tables and chairs or other “improvements” that call attention to their man-made quality. If you really like the idea of using sharp tools in the woods, such as axes and saws, sign up to volunteer! You’ll meet some of the finest backcountry woodsman around and you’ll have the chance to use really big saws and other sharp tools to clear brush and blown-down trees from the trail.